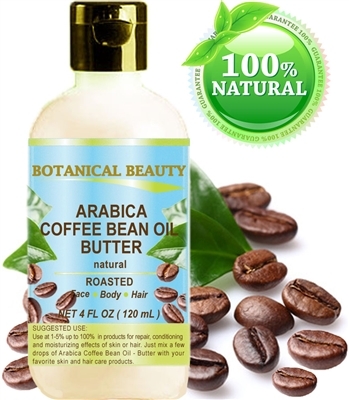 ARABICA COFFEE BEAN OiL BUTTER 100 % Natural 4 Fl. oz. - 120 ml. One of the best butters to reduce wrinkles, puffiness, dark circles. Anti-Cellulite. One of the best butters to reduce wrinkles, puffiness, dark circles. Anti-Cellulite. One of the best butters to reduce wrinkles, puffiness, dark circles. Anti-Cellulite. ARABICA COFFEE BEAN OiL BUTTER 100 % Natural 8 Fl. oz. - 240 ml. One of the best butters to reduce wrinkles, puffiness, dark circles. Anti-Cellulite.